Better late than never. That's what T-Mobile and Sony must've thought when they decided to help the Sony Xperia Z1 swim across the ocean and hit the US carrier's domain. Dubbed, the Sony Xperia Z1S, the phone isn't too far off from its international brother and we're here at the showroom floor at CES 2014 to tell you what has changed. 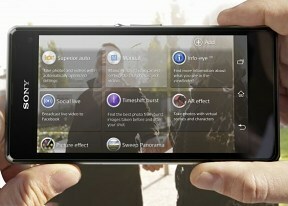 On the outside, Sony has kept the beautiful exterior of the Z1 and has made tiny alterations to the overall design. The Xperia Z1S is still built around the same 5" full HD TFT LCD display and packs the gorgeous glass-body of its surrogate. The water- and scratch-resistant capabilities remain intact as well. The few changes made to the Z1S for T-Mobile include the presence of 32GB onboard memory instead of 16GB on the international model. The new model continues to have the microSD card slot, so no worries there. Additionally, the 3.5mm headphone jack on top has been moved to the center from the near the left side on T-Mobile's request. Under the glass back of the Xperia Z1S, which now sports a T-Mobile logo at the bottom, sits a non-removable Li-Ion 3,000 mAh battery. We extensively tested the international model of the phone and deducted it can last up to 53 hours if you do an hour of movie watching, web browsing and calls a day. Anyway, the Sony Xperia Z1S is powered by a 2.2GHz quad-core Snapdragon 800 chipset with four Krait 400 cores, Adreno 330 GPU and 2GB of RAM. It packs plenty of oomph and runs Android 4.3 Jelly Bean perfectly well with KitKat planned some time down the road. T-Mobile offers its customers nice incentives to choose the Xperia Z1S. It comes with six free movie downloads from Video Unlimited, including Captain Phillips, on the day of its digital release, 10 handpicked PlayStationMobile games, and a 60-day free trial of Music Unlimited. For more information, we advise you to take a look at our detailed Sony Xperia Z1 review, which covers the Xperia Z1S twin quite nicely.